Our Natchez Trace tour is looming in front of us, and I’ve been busy wandering around Alaska and Canada and Europe eating decadent foods. Time to jerk into training mode. We got home from London last Friday night. On impulse, I woke up Sunday morning and jumped on the Surly for a crank up Bush Highway and out by Saguaro Lake. It’s 31 miles and 2000 feet of ascent, all before breakfast, where I met Jesse at Phil’s Filling Station. Here in Arizona in August, it is the monsoon season. Morning temps hit the usual 95F but the humidity is significantly high, around 30 or 40% RH. By the time I arrived, my legs were mush and the whole body completely overheated. Phil’s serves an excellent American breakfast, sort of a 50’s diner place. Service was good too. Of course, it’s always a pleasure to meet with Jesse and discuss world politics and medicine and technology and where ever else the conversation goes. 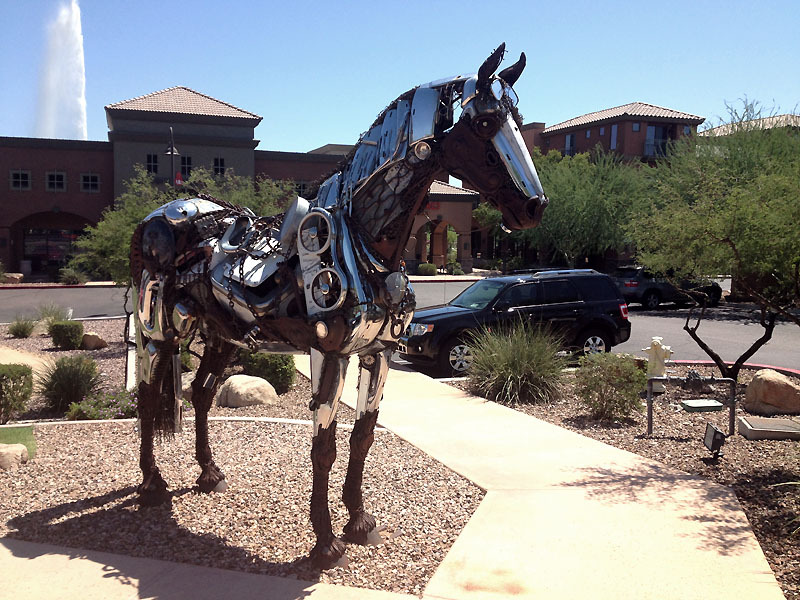 This horse sculpture in just off Saguaro Boulevard in Fountain Hills. You can see the town’s famous fountain in action behind it. Unfortunately, I then had to ride another 20 miles home, with temps soaring. This was the very hottest ride I’ve ever experienced. About 105F, high humidity, and no breezes except for self-created ones. I rode in “heatstroke protection” mode the whole way home, going easy and stopping often to down water. On McDowell road, while I sat with a water bottle, a lone cyclist emerged from the other direction. As he passed, he called out, “Hey old school! Nice steel frame!” which really made me grin. So, while sort of a hair-brained plan to go so far in such heat, I’m happy I did it anyway. My conclusion is that I just might be able to dive headlong into this tour without much training, even if it hurts. Once again, as a reminder, I have turned off the comments to this blog. You can thank the spammers.